The Virgo cluster of galaxies is a close group of galaxies that is very impressive when viewing through the eyepiece. First locate the star Denebola – the end star of the Leo the Lion. Proceed to move about eleven degrees east and a bit south until you arrive at the coordinates; right ascension (RA) 12 hours 28 minutes and declination (Dec) +12 degrees 13 minutes. Your telescope is now at the somewhat heart of the vast swarm of a hundred or so remote galaxies down to 14th magnitude. From here you will be galaxy hopping to these faint objects. The challenge of sky conditions and your telescope is to see how faint a galaxy you can discern. One of my favourite regions of the Virgo cluster is the pair of M84 and 86 that form the right most end of Markarian’s Chain of galaxies. They are listed at magnitudes 9.2 and 8.7 respectively with M86 being 50% larger than our Milky Way Galaxy. Both are about 55 million light years away. Just as the name suggests, it is a line of eight galaxies stretching from NGC 4458 and ending at M84. This cosmic lineup takes up one and a half degrees of sky or three full moons placed side by side. Other smaller galaxies dot the area below the Chain. Moving back west about a quarter of the way to Denebola and a bit north you will come across M99 which lies across the border in Coma Berenices. 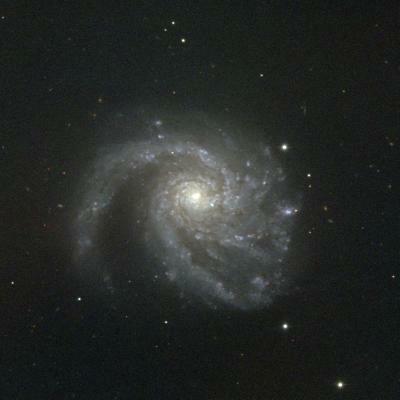 This 60 million light year object is a magnitude 9.7 face-on spiral galaxy with extended arms. This galaxy has seen three supernovas back in 1967, 1972 and 1986. For a change of pace from galaxies, follow Comet PanSTARRS (C/2016 M1) as it move south towards Sagittarius. Currently at magnitude 10.5, we should have a couple of months to observe and photograph it. The planet Venus continues it steady climb higher each night as it has passed between the Pleiades and Hyades cluster. The planet is still well positioned for a photo opportunity with the two clusters. In the south east, Jupiter rises at sunset and is at opposition on May 9 and the closest to Earth. This is the best time to observe and image the subtle detail of its cloud tops and or course the four Galilean moons. For crisp images, just wait a few hours for the planet to climb higher in the sky as the night progresses. Saturn and Mars rise about four and five hours respectively after Jupiter with Mars starting to put on its great show till the end of July. Over the past month, Mars has been gaining in brightness from magnitude +0.4 to -0.2. Keep taking note of its ever changing movement and brightness. New Moon occurs on May 15 with the full Frog Croaking Moon on May 29. Until next month, clear skies everyone.